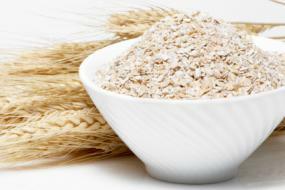 oat bran is a good source of soluble fiber, while wheat bran is a good source of insoluble fiber. Soluble fiber may help to decrease cholesterol levels, and insoluble fiber promotes healthy bowel functioning. In various human trials, oat bran eaten as oatmeal for breakfast appears to have reduced cholesterol by about 10 percent as compared to wheat bran, which lowered cholesterol levels by roughly 4 percent. Oat bran contains soluble fiber, which forms a sticky, gel-like substance in the digestive tract that binds to cholesterol and pushes it out of the body through the stools. Wheat bran on the other hand contains insoluble fiber. Insoluble fiber is good for bowel health and promotes regularity, but it does not remove cholesterol from the body. Perhaps it is the soluble fiber,beta-glucan, found in oats, but not wheat, which is thought to be important in reducing the riskof coronary heart disease. Whole grains are composed of bran, germ and endosperm. When a grain is refined, such as in white bread or white rice, the bran and germ are removed, leaving only the endosperm. The beneficial vitamins, minerals, fiber and phytonutrients are contained within the bran and the germ, which is why whole grains are healthier than refined grains. Bran and germ products are also available separately, as in the case of wheat and oat bran, and are concentrated sources of many nutrients. While both oat and wheat bran are very healthy foods, they each offer distinct nutrient profiles. 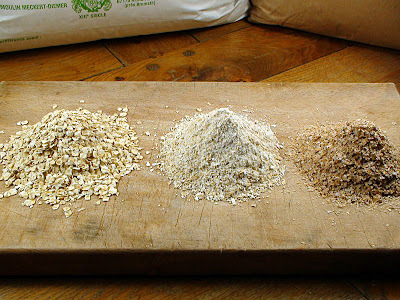 The fat, protein and carbohydrate composition of oat and wheat bran differ only slightly. According to NutritionData, oat bran contains one gram more of each macronutrient on a per-ounce basis. One ounce of wheat bran contains one gram of fat, 18 grams of carbohydrates and four grams of protein. One ounce of oat bran contains two grams of fat, 19 grams of carbohydrates and five grams of protein. Wheat bran and oat bran are both good sources of vitamins, particularly B vitamins. According to NutritionData's nutrient analysis, wheat bran contains 10 percent or more of the daily value of four B vitamins---thiamin, riboflavin, niacin and vitamin B6. Oat bran, on the other hand, only contains that much of one vitamin, thiamin. The amount of thiamin in oat bran is actually three times greater than in wheat bran. Oat bran and wheat bran are also good sources of multiple essential minerals. Both are great sources of magnesium, phosphorus, manganese and selenium. In fact, one ounce of wheat bran contains 3.2 milligrams of manganese, which is 161 percent of the daily value. They also are both good sources of potassium, zinc, iron and copper. Wheat bran contains more of all these minerals than does oat bran, when compared on an ounce-for-ounce basis, according to NutritionData. Both oat and wheat bran are good sources of fiber, though the type of fiber they contain differs. One ounce of wheat bran contains 12 grams of fiber, while one ounce of oat bran contains four grams. According to the American Heart Association, oat bran is a good source of soluble fiber, while wheat bran is a good source of insoluble fiber. Both types of fiber are important for health. Soluble fiber may help to decrease cholesterol levels, and insoluble fiber promotes healthy bowel functioning. According to WHFoods, wheat bran has been shown to have specific cancer-preventing properties that oat bran cannot match. Wheat bran may promote increases in the metabolism of estrogen in the body, which may help decrease the risk of developing breast cancer. Wheat bran has also been shown to decrease the amount of cancer-promoting substances in the colon, making it a potential protector against colon cancer as well. On the flip side, wheat bran also promotes good health but in different ways. Constipation, irritable bowel syndrome, and digestive problems plague many Americas. Researchers recommend about 25-35 grams of dietary fiber per day for adults yet most people consume only about 12 grams, less than half of what is needed to promote regularity. The answer may be a healthy one half cup serving of wheat bran, which has only about 60 calories yet 12 grams of fiber and a good dose of niacin and vitamin B6. Good bowel health is essential for many things. The bowel or colon removes toxins from the body, and if you are not eliminating regularly, toxins can build up in the system. Bacteria in the gut also produce vitamin K and help synthesize many vitamins. New evidence also shows that serotonin, the brain chemical responsible for moods, is produced mostly in the colon rather than in the brain as once thought. A healthy colon usually means the entire body is healthy, so eating foods rich in fiber and taking good care of your colon can boost your overall health. Here we have Rolled Oats, Oat Bran and Wheat Bran. For the sake of the Dukan Diet, we're interested in Oat Bran (Son d'avoine in French), not Rolled Oats. Dr Dukan says that we can have two tablespoons of Oat Bran per day and one tablespoon of Wheat Bran per day. Mix it up with an egg and a couple of tablespoons of 0% cream cheese and you can have a substantial pancake or add it to your yoghurt or 0% cream cheese as a desert. We sometimes add a teaspoon or two to a chicken curry sauce to thicken it. 1. Wheat bran consists of insoluble fibres; oat bran consists of soluble fibres. 2. The insoluble wheat bran fibres are softened as they pass through the various parts of the body, and they bulk up the stool, causing speedy elimination of waste. Oat bran fibres are dissolved, and form a gel. As the soluble fibre mixes with the bile acids in the intestine, it helps to remove cholesterol. 3. One half cup of wheat bran contains about 12 gm fibre, 60 calories and one gram of fat. One half cup of oat bran contains 7 gm fibre, 150 calories and 3.5 gm fat. 4. Wheat bran is a good source of Niacin and B6, whereas Oat bran is a good source of folate and thiamine. what is wheat bran in french? Can we discuss phytic acid. rolled oats, and steel cut oats purchased at the local grocier. should we be concerned with the content of phytic acid, or does the processing of the oat reduce the amounts of it?